(From left) Bashundhara Group’s advisor (information and media) Mohammad Abu Tayeb, Chief Marketing Officer of Bashundhara Cement Saiful Islam Helali, Senior Deputy Managing Director of the Group Mohammad Belayet Hossain, Senior Executive Director AKM Mahbub-Uz-Zaman, and Company Secretary of the group Nasimul Hai, are seen at a briefing in the city on December 12. Any person or institution individually or jointly can take part in the competition through designing the bag along with a logo. A competitor can send highest three designs through E-mail, CD or print copy. The winner will get Tk 500,000 as prize money. 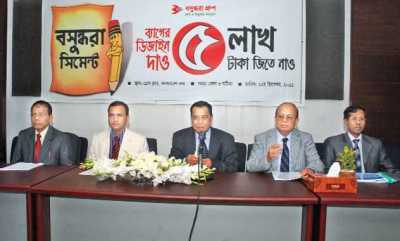 Officials of Bashundhara Industrial Complex Ltd (BICL) announced the competition at a press briefing held at the National Press Club in the city. The deadline for submitting the designs is January 10, 2012. Bashundhara Group’s senior deputy managing director Mohammad Belayet Hossain, advisor (information and media) Mohammad Abu Tayeb, senior executive director AKM Mahbub-Uz-Zaman, chief marketing officer of Bashundhara Cement Saiful Islam Helali, and company secretary of the Group Nasimul Hai, were present, among others, at the briefing. He said the company’s upcoming cement venture will be a Tk 14-billion project. Of the total amount, Tk 1.81 billion will come from bank loan and the rest will be borne by Bashundhara Group. AKM Mahbub-Uz-Zaman said the new cement will be cost efficient for the consumers. “We have introduced latest technology in cement manufacturing which will also reduce the production cost, making the product more cost efficient for the consumers,” he said. The distinguish judges will select 20 designs initially and those will be sent to the respective participants to make necessary changes, if needed. Later, three designs will be shortlisted from the 20 designs and the best will be selected from short-listed ones through an intensely scrutinised process, officials told the press briefing. The new cement factory, with a capacity of producing 3.3 million tonnes of cement per year, will go into production in March next year, they added.